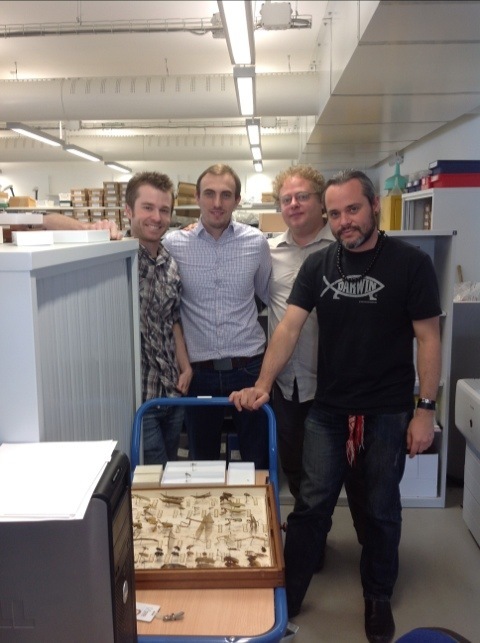 Work begins at the British Museum of Natural History to image the type specimens of mantises held in the collection. Target taxa from the Neotropics and the Flower mantises are first up. Imaging begins with the Banks collection with a few types of Fabricius. Standing over the drawer are Gavin Svenson (left), Martin Stiewe (center left), George Beccaloni (center right), and Julio Rivera (right).